Please note that the content of this book primarily consists of articles available from Wikipedia or other free sources online. 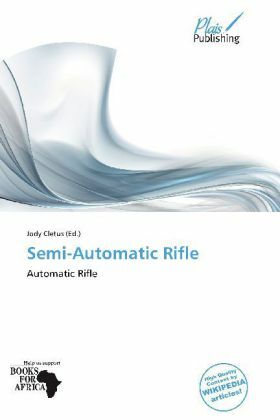 A semi-automatic rifle is a type of rifle that fires a single bullet each time the trigger is pulled, automatically ejects the spent cartridge, chambers a fresh cartridge from its magazine, and is immediately ready to fire another shot. They may be operated by a number of mechanisms, all of which derive their power from the explosion of the powder in the cartridge that also fires the bullet. Historically, the self-loading design was the successor to the repeating rifle, which stored a number of cartridges within the weapon, but required manual action to load a fresh cartridge before each shot. Automatically loading the next round more easily allows for rapid fire. These rifles are also commonly known as self-loading rifles ('SLR') or auto-loading rifles.